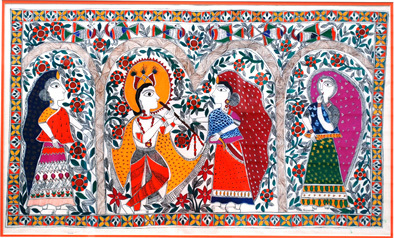 Mithila art has roots in the Madhubani region of North India where it has been practiced by women for centuries. They painted the mud walls of their homes and temples with murals depicting epic stories from the Hindu mythology and rites and rituals of daily life. Later, they started to transfer their art to paper and garments for commercial purposes and adopted modern paints, abandoning nature-derived paints, which were once closely guarded secrets among families. Having practiced the art of Mithila for almost 20 years, Sunanda Sahay is to be credited for maintaining the arts relevance and purity. In addition to exhibiting at major museums and universities, Sahay serves the Indian expatriate community by teaching and donating her art to charitable causes. For as long as she can remember, apprentice Anindita Lal has been fascinated by the stories from which Mithila paintings are drawn. She hails from the caste, gender, and region that propagated the art form. She is already adept at the basic patterns and motifs of Mithila painting, and has moved on to animals, birds, flowers, and more complicated human figures and scenes. The FY17 apprenticeship will advance Anindita's understanding of the grammar that all Mithila artists adhere to by discussing the stories, history, and symbolism behind the art. She will also learn to use natural colors extracted from mineral and plant juices.